Uniquely bringing together discourse analysis, critical literacy, and teacher research, this book invites teacher educators, literacy researchers, and discourse analysts to consider how discourse analysis can be used to foster critical literacy education. 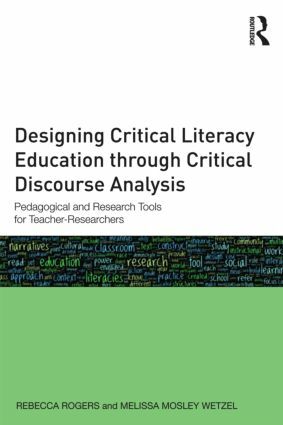 It is both a guide for conducting critical discourse analysis and a look at how the authors, alongside their teacher education students, used the tools of discourse analysis to inquire into, critique, and design critical literacy practices. Through an intimate look at the workings of a university teacher education course and the discourse analysis tools that teacher-researchers use to understand their classrooms, the book provides examples of both pre-service teachers and teacher educators becoming critically literate. The context-rich examples highlight the ways in which discourse analysis aids teachers’ decision making in the moment and reflections on their practice over time. Readers learn to conduct discourse analysis as they read about critical literacy practices at the university level. Designed to be interactive, each chapter features step-by-step procedures for conducting each kind of discourse analysis (narrative, critically oriented, multimodal), sample analyses, and additional readings and resources. By attending to the micro-interactions as well as processes that unfold across time, the book illustrates the power and potential of discourse analysis as a pedagogical and research tool.